We offer quality repair and competitive prices for all of your exhaust system and muffler repair needs. Make sure to stop by our 7121 John F Kennedy Blvd location for an inspection, as a damaged exhaust can hurt both your car and the environment. 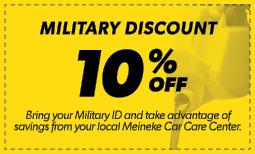 When you need brake repair, brake pad replacement, or even a total brake job, our local North Little Rock, AR Meineke is there to help you with everything you need to drive (and stop) safely. Brian was very helpful and informative. He is very professional and courteous. Great communication!!! I had an appointment in the afternoon but they were unable to work on it that day because a worker had to leave early (family problem or sickness I forget) Anyway they weren't able to do it that night so the man at the front desk accommodated to my schedule and gave me an oil change for free the next morning! Both times I visited the mechanic who worked on my car spoke to me personally about my service. That was above and beyond what I have received from other auto places. Very happy with both experiences.